Address: 749/1 Chayangkul Road, Muang District, Ubonratchathani 34000, Thailand. 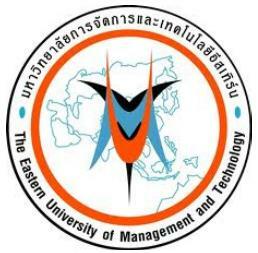 The Eastern University of Management and Technology has been exerting for academic services for people and communities in Ubon Ratchathani for long times. It had started as Sittitham Technic School and has been set up as the North Eastern Polytechnic School in 1983 for continuing serving in academic service to people.The North Eastern Polytechnic School still maintains this ideology until today. In February 1999, the North Eastern Polytechnic College was established to be one of the higher educational institute in Ubon Ratchathani with the vision of being first class institute in the Northeastern region. On 18 November 2005, the College Council offered all related decuments and other evidences to Office of the Higher Education Comission for granting a new status as the university and have changed its name to “The Eastern University of Management and Technology” on 21 July 2009. The University is situated on a 12 rai of land with educational facilities and sports services for the students, At Present, There are proximate 4,000 students in the Polytechnic School. The Easter University and Technology is the leading institution of education and center of managing higher education in Asia which emphasizes on producing qualified people and to build the knowledge of community and management administration, technology and other co academics in order to fulfill producing qualified professional. To arrange higher education and advanced vocational studies which come from the real need not only in national level but also regional level in order to plan and manage cooperation in education with both public and private institution domestically and internationally. Also, providing the follow-up system and changing the order arrangement of importance efficiently. To produce qualified people for first-class employers by designing teaching and learning curriculum in form of interdisciplinary studies which provides multi-dimension and also sets the incubator center for strengthening graduated people. To manage substantial research and development and to support all instructors and students to create innovation from their gained knowledge in order to find developing path to the implementation. To build up synergy with others domestic and international leading educational institutes in order to be strategic partners in academic, training, etc. in form of MOU-memorandom of understanding. To be sources of academic service in management and technology in order to fulfill the need of internal society and overseas. To maintain culture and tradition for keeping the national identity and to spread the pleasant national culture and tradition internationally. Dr. Dino Cinel Ph. D.
Merle Curti Award 1984 by Society of American H.
Sorry you need to apply to them direct. Sorry sir, if you want to apply for jobs better you contact them direct.